Such a beautiful story amongst such devastation! Thx Lindsey! what a beautiful encounter!!!!!!!!!!!!!!!!!!!!! after such tragedy!!!! bellissimo!!!!! Joy in the midst of tribulation. It is so heartwarming and tear producing at the same time to see Marilyn and Bear reunited. Thanks Lindsey. Poor Bear! He won't forget that noise and shambles, or his reuniting. I'm glad that she found Bear and that he is okay! 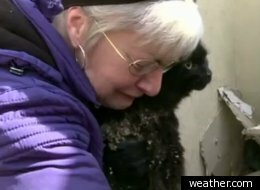 Bless her heart and the cats, she was crying when she saw her cat... Poor kitten i am glad to see a happy ending through all this they have been through. Her home was destroyed and i am glad she has found to see something for her left. I am so glad that they are both alive and reunited. Wonderful to watch the reunion! Why do I put myself through these videos? The woman lost everything material, but got back what really mattered. I am soglad she found her cat. Oddly enough Bear looks just like my cat that passed away, and his name was Bear. R.I.P. crying, but happy! so happy. thank you lindsey. Yes, it did bring a tear to my eyes! So happy this Cat was found safe. Joy among heart break. Thx for the article. I am still crying. Lucky Kitty!! & his Mom too!! Such Joy!! SUCH A HEART WARMING STORY! I am also crying. Thanks for sharing Lindsey. Very sweet, brought a tear to my eye. Reminds me of my beautiful cat. This is wonderful. These pets are going to be very therapeutic for the people who lost everything. For some, it might even be a reason to go on. Animals are the best aid in recovering from a trauma. Awesome story. Its noted. Thank you Lindsey.